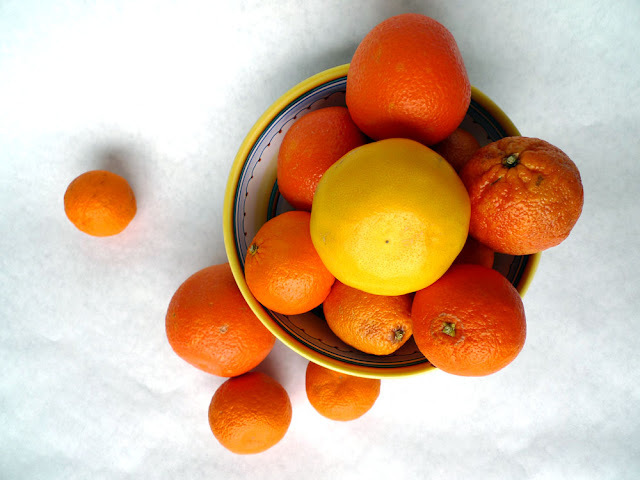 Citrus season brings a necessary and amazing wallop of pizazz to these bleak winter days. It’s like a burst of fresh air, with a hint of zest. I love going into my local grocery store and seeing the absolute abundance of all these different types of citrus: a true feast for the eyes! I go in an out of liking citrus, so I decided to figure out why. I believe it comes down to the fact that I don’t really crave a juicy orange unless it’s cold outside. Go figure! Eating a bad orange for me is like eating a bad tomato or peach — the memory is hard to erase. And I’ve found that a lot of Valencia oranges and Naval oranges – like the ones you might find at Safeway – to be absolutely tasteless and super fibery, and not in a good way either. It wasn’t until I decided to try different types of citrus while they were in season did I find that I really love the tangy, sweet juice and delicate pieces that come from this amazing fruit category. So I did some sleuthing and bought a variety of citrus fruits to share with you and to try myself!